"Bild and Clinton in conference before decision on Assange extradition"
After the publication of this article it was communicated that State Secretary Hillary Clinton had, for sad familiar events, to cancel her trip to London and unable to attend to the meetings at the Conference mentioned in this article. Previously, UK Foreign Affairs Minister William Hague had himself confirmed the participation of Secretary Hilary Clinton on Twitter (14/10, 2011), and her name was in the London Cyber Conference Program I reviewed in my publication. 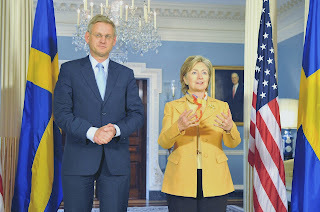 As Secretary of State Clinton and Vice President Binden represent the same official stand of their government, these developments do not alter the political issues or inferences referred in my analysis in the article above.  8 August. "Man har sålt en lögn till allmänheten"
 15 April 2011. Rigged documentary on Julian Assange in the Swedish National Television. Part 3: "Men are animals"
 28 Feb 2011. Mark Stephens: "Demand open justice for Julian Assange"
 9 Feb 2011. Strongest appeal to Swedish prosecutor - "Hamlet without princess"